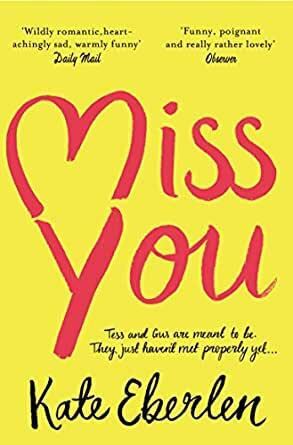 Miss You is Kate Eberlen's absolutely wonderful debut novel. I loved the cover as it reminded me of a patchwork quilt. And then I looked a little closer at the pictures in the letters. It is two people who always seem to be headed in a different direction, never quite meeting. And that is the premise of Miss You. Miss You opens in 1997 when both Tree (short for Teresa) and Gus are on holiday in Italy. They both happen to visit a church at the same time, exchange a few words and then go on with their lives. Eberlen has created rich, full lives for both Tree and Gus. But not perfect - their lives are also filled with loss, grief, anger along with the happy moments. Miss You is told in alternating chapters, in the same time frame, from the two as the years progress. And unusually for me, I didn't have a favourite - I liked them both the same. I became so caught up in each of their lives and kept reading 'just one more chapter' to see what might happen next. What happened next, but also where. For you see, in every new time period, there's a moment when their paths cross. Not directly at first, but in passing, without recognizing that they've already met. "We think we choose our friends, but perhaps it's only just a matter of chance." "Do you believe in the one? As in, there's one person out there who's destined for you?" With every new entry and years passing, I found myself hoping for that 'star-crossed lovers' moment that their paths would cross. Do they? Will things come full circle? I'm not saying - you'll have to read Miss You to find out. I adored this book - it's warm, witty, heartwarming and real - with a touch of just maybe.......I'm looking forward to what Kate Eberlen writes next! 5.0 out of 5 starsTop Holiday Read! Such an enjoyable read! Wonderful descriptions that had my mind walking back through London and Florence. Funny, sad, truthful and love in all its ways. Top holiday read. A book that keeps you right on your toes, absolutely to the very end. I highly recommend it to everyone. 3.0 out of 5 starsI felt that there could have been more commonalities to make this relationship feel more believable. Both Tess and Guss live very contrasting lifestyles that take them in different directions, including exhausting and unhappy relationships and their subsequent emotional rollercoasters. The threads of their lives imperceptibly intercept along those journeys but never seem to truly connect. Both feel unfulfilled as they put the needs of others ahead of their own, including Tess's devotion to her much younger sister who has Asperger Syndrome. Did I like this story. Hard to say. Despite a whopping 433 pages of text, I found it hard to really determine what Tess and Guss really wanted out of life. After struggling through numerous painful relationships, I found that story simply ran out of steam and the ending felt rushed and contrived. Not a fan of "insta-love" stories, I felt that there could have been more commonalities to make this relationship feel more believable.